Cookes Band instruments have been proudly dealing Shure Microphones and Accessories for as long as we can remember and with good reason. These industry standard Mics suit both professionals and beginners alike with warm,clear vocal reproduction and second to none durability. The company was first registered in the USA around 1925. The began life selling spares for wirless radios and it wasn't until 1931 that the very first microphone (The model 33n two button carbon microphone) was born. Lets take a closer look at a few of our most popular models. The Shure SM-58 needs no introduction. The stalwart of every Audio Engineer in the land, the go-to Mic for professionals all over the world. Since its introduction in 1966 ( Yes we had them in stock then too!) it has remained largely unchanged. Modern modifications include the addition of switches and wireless versions. Almost every singer will have an "Sm-58" story about how its survived the perils of the road! The origin of SM57 may be traced to 1937, when Shure engineer Benjamin Bauer developed the first single-element directional microphone, the Unidyne, which had a Cardiodpickup pattern.In 1959, another Shure engineer, Ernie Seeler, advanced the art of microphone design significantly with the Unidyne III. Seeler torture-tested the Unidyne III during three years of research and development and thereby, produced the SM series of rugged and reliable Shure microphone capsules. The "SM" stands for Studio Microphone; Seeler was an aficionado of classical music and expected the SM57 to be used for orchestras. Because he "despised" rock music the TEC Foundation said that it was "ironic" that the microphone has become "a mainstay of rock music. More commonly in 2018 we recomend these for instrument amplification such as guitar amps and snare drums! In 1939 Shure introduced the Model 55 Unidyne Microphone, Now modernised into the the SH55ii (displayed above). 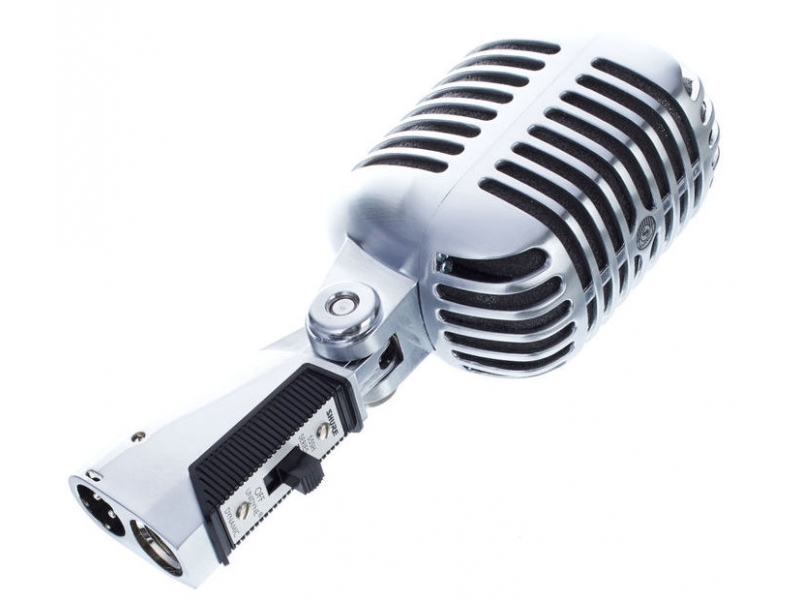 These took the world by storm often replicated buy others but never equalled, these classic mics are suitable to not only get "the look" but also the sound of classic Jazz and swing vocals. It still to this day is one of the worlds most recognisable mics. They currently offer ranges to suit every budget and need by offering the cost effective PGA series, The industy standard SM series and premium quality BETA series microphones. All our prices can match every other retailer in the UK and best of all you get to come see our lovely smiling faces at the same time! We are happy to demonstrate any and every Mic in the range to find one suitable for you !